Mmmm. Bring balance to the force you must. Save the way of the Jedi you must. Mmmm. Success you will find this Halloween. That’s right! All you need to do in order to defeat the Sith and the forces of the dark side is have the perfect costume. That costume would obviously be the greatest Jedi master to have ever lived, Yoda! 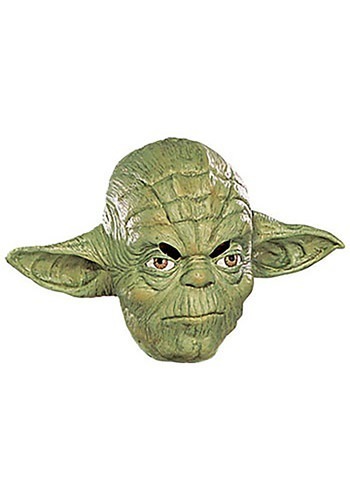 You may not be a tiny green, big-eared alien from a galaxy far, far away but you can look just like one when you toss on this Yoda Vinyl Mask 3/4. Whether you need to fight Emperor Sidious in a head to head battle or prepare Luke Skywalker to take on Darth Vader, you’ll look more than ready with this amazing detailed mask! Grab a Jedi robe along with a wooden walking stick prop and your Jedi transformation will be complete. Be sure to memorize a few of Yoda’s famous quotes so you can pass down plenty of knowledge to the young padawans you come across. Just be sure to have a handy lightsaber in your back pocket in case any Sith decide to make a ruckus this Halloween!